Alex Theoharides (@Minne_Pop) takes a moment of breath from his T-Wolves mania to provide an easy-to-read team guide for the 2012 Minnesota Timberwolves. Anyone who is anyone in Minneapolis will tell you that ours is a city overrun with hipsters. From the flannel-wearing bikers who ride boldly to work in the heart of our annual January freeze to our local rhyme saying crew, Minneapolis is a dangerous place to be if you don’t appreciate skinny jeans, Buddy Holly glasses or the occasional interaction with college freshmen smoking pipes packed to the brim with free range, organically grown and locally sourced tobacco. The latest threat to our once peaceful streets? 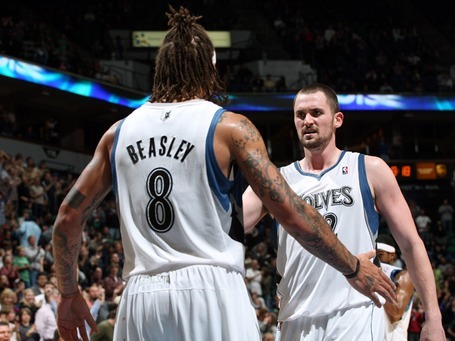 None other than our beloved hoopsters—Yes, Ladies and Gents, its the Timberwolves. 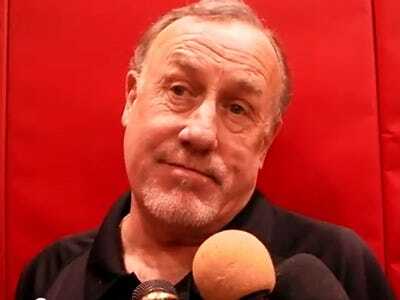 Puzzled by the T-Wolves sudden relevancy? You’re not alone. As Mrs. Minnepop’s secret crush Bob Collins remarked recently on Twitter, it’s been 12 years since Malik Sealey hit the most (the only?) famous shot in T-Wolves history. Sure, this is the same inept team sent to replace our once mighty Minneapolis Lakers and our once fishy Minnesota Muskies. OK fine, it’s more or less the same group of youngsters that finished with the worst record in the NBA last season. And yes, it’s the same team that gets pushed off the air every time there’s a college hockey tournament or an ice fishing competition in town. But trust me this year it’s different. This year … This year … We have RICKY RUBIO!!! Without further ado, I present the who’s who guide to Your 2012 Minnesota Timberwolves. Game: Scratching chin, rubbing head. Hipster Cred: Used to wear short shorts. Claim to fame: Wearing black turtlenecks under gray suit jackets. Don’t believe me? Google him (dirty). Game: Grabbing rebounds, taking names. Looks like: A sumo wrestler. Hipster Cred: Has beard, does yoga, The Beach Boys’ Mike Love is his uncle. Claim to Fame: Has his own cologne. Game: In the immortal vernacular of Walt Clyde Frazier, “Dancing and Prancing, Dishing and Swishing, Hustling and Bustling, Movin’ and Grovin’!, Shaking and Baking, Slicing and Dicing, Spinning and Winning, Styling and Profiling, Swooping and Hooping, Wheeling and Dealing, Winning and Grinning. Nicknames: Tricky Ricky, Ricky Potter, The Holy Ole! (OK, so I just made that up). Hipster Cred: Need I say more? Claim to fame: Being adorable in Outside the Line specials. Game: Dunks and Treys, Baby, Dunks and Treys. 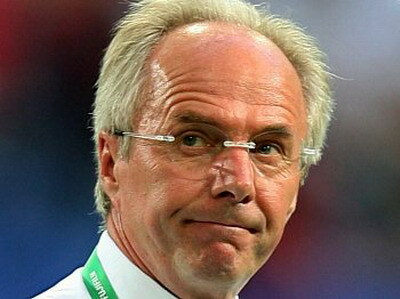 Looks like: According to the Internet, Sven Goran Eriksson. Presumably, the Internet is referring to a different Derrick Williams. Hipster Cred: Posts pictures of puppies on Twitter. Claim to fame: This block. Looks like: He’s about to cry. Hipster Cred: Tartan Pants? Double-breasted club blazer? Contrast-collar yellow shirt? What?!? Claim to fame: Share’s the same name as this fine fella. Looks like: He thinks he’s very good looking. Or he’s constipated. Either way. Hipster Cred: Used to rock Tar Heel blue. Claim to fame: Dated (dates?) this woman. I don’t know who you are or what you look like. Apparently, neither do the Twolves. Game: Step back threes, highlight reel drives to the paint. Hipster Cred: Has beard, expert at making funny faces. Claim to fame: Dated Miss Universe. Game: Poorest man in the world’s Steve Nash. Nickname: Frodo, The Mop, Cool Hand Luke, Lucky Luke. Looks like: Flea from the Red Hot Chili Peppers. Hipster Cred: Went to college near Portland. Claim to fame: Best basketball player from Coeur d’Alene, Idaho. Game: Sitting on the bench, recovering from back surgery. Looks like: A taller, skinnier Webster. Hipster Cred: His first name is Martel. He grew up in Seattle. Check out the hair. Total hipster. Claim to fame: Best player named Martel in the NBA. Game: Dropping passes, fouling out. Nickname: Drako Malfoy, Donny Darko, The Human Victory Cigar, Could Have Been Carmelo. Looks like: Every bully from every movie ever made. Hipster Cred: Occasionally sports an ironic mustache. 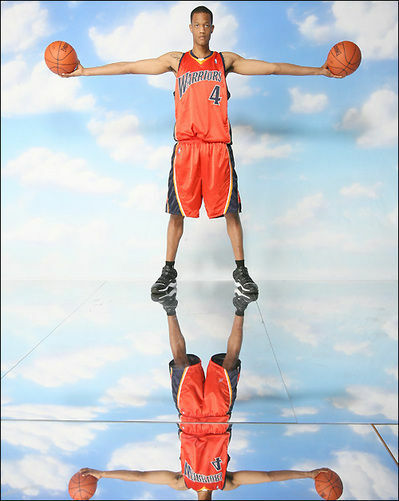 Claim to fame: Picked ahead of Carmelo Anthony in the 2003 NBA Draft. Game: Shooting, missing, talking to himself, shooting again, not passing, shooting some more. Claim to fame: Getting busted for marijuana possession. Game: Random acts of athleticism. Hipster Cred: Can fit into skinny jeans. Game: If you have six fouls, you may as well use all of them. Hipster Cred: Hard to tell: All the hipsters I know are too terrified to approach him. Claim to fame: Best tattoo in the NBA. Game: Scowling, sitting on the bench, being injured. Hipster Cred: Thick beard, former teammate of Vlade Divac. Claim to fame: Once had cornrows (it wasn’t pretty).